Founder of western monasticism, born at Nursia, c. 480; died at Monte Cassino, 543. The only authentic life of Benedict of Nursia is that contained in the second book of Saint Gregory’s “Dialogues”. It is rather a character sketch than a biography and consists, for the most part, of a number of miraculous incidents, which, although they illustrate the life of the saint, give little help towards a chronological account of his career. Saint Gregory’s authorities for all that he relates were the saint’s own disciples, viz. Constantinus, who succeeded him as Abbot of Monte Cassino; and Honoratus, who was Abbot of Subiaco when Saint Gregory wrote his “Dialogues”. 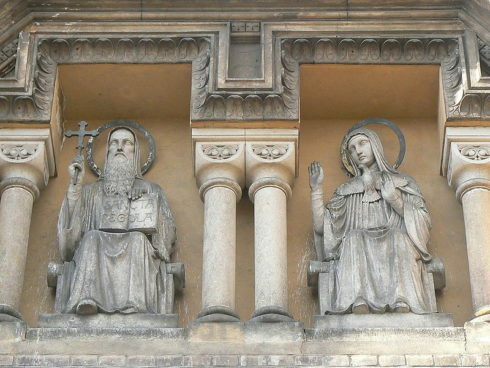 Benedict was the son of a Roman noble of Nursia, a small town near Spoleto, and a tradition, which Saint Bede accepts, makes him a twin with his sister Scholastica. His boyhood was spent in Rome, where he lived with his parents and attended the schools until he had reached his higher studies. Then “giving over his books, and forsaking his father’s house and wealth, with a mind only to serve God, he sought for some place where he might attain to the desire of his holy purpose; and in this sort he departed [from Rome], instructed with learned ignorance and furnished with unlearned wisdom” (Dial. Saint Greg., II, Introd. in Migne, P.L. LXVI). There is much difference of opinion as to Benedict’s age at the time. It has been very generally stated as fourteen, but a careful examination of Saint Gregory’s narrative makes it impossible to suppose him younger than nineteen or twenty. He was old enough to be in the midst of his literary studies, to understand the real meaning and worth of the dissolute and licentious lives of his companions, and to have been deeply affected himself by the love of a woman (Ibid. II, 2). He was capable of weighing all these things in comparison with the life taught in the Gospels, and chose the latter, He was at the beginning of life, and he had at his disposal the means to a career as a Roman noble; clearly he was not a child, As Saint Gregory expresses it, “he was in the world and was free to enjoy the advantages which the world offers, but drew back his foot which he had, as it were, already set forth in the world” (ibid., Introd.). If we accept the date 480 for his birth, we may fix the date of his abandoning the schools and quitting home at about A.D. 500. Benedict does not seem to have left Rome for the purpose of becoming a hermit, but only to find some place away from the life of the great city; moreover, he took his old nurse with him as a servant and they settled down to live in Enfide, near a church dedicated to Saint Peter, in some kind of association with “a company of virtuous men” who were in sympathy with his feelings and his views of life. Enfide, which the tradition of Subiaco identifies with the modern Affile, is in the Simbrucini mountains, about forty miles from Rome and two from Subiaco. It stands on the crest of a ridge which rises rapidly from the valley to the higher range of mountains, and seen from the lower ground the village has the appearance of a fortress. As Saint Gregory’s account indicates, and as is confirmed by the remains of the old town and by the inscriptions found in the neighborhood, Enfide was a place of greater importance than is the present town. At Enfide Benedict worked his first miracle by restoring to perfect condition an earthenware wheat-sifter (capisterium) which his old servant had accidentally broken. The notoriety which this miracle brought upon Benedict drove him to escape still farther from social life, and “he fled secretly from his nurse and sought the more retired district of Subiaco”. His purpose of life had also been modified. He had fled Rome to escape the evils of a great city; he now determined to be poor and to live by his own work. “For God’s sake he deliberately chose the hardships of life and the weariness of labor” (ibid., 1). A short distance from Enfide is the entrance to a narrow, gloomy valley, penetrating the mountains and leading directly to Subiaco. Crossing the Anio and turning to the right, the path rises along the left face oft the ravine and soon reaches the site of Nero’s villa and of the huge mole which formed the lower end of the middle lake; across the valley were ruins of the Roman baths, of which a few great arches and detached masses of wall still stand. Rising from the mole upon twenty five low arches, the foundations of which can even yet be traced, was the bridge from the villa to the baths, under which the waters of the middle lake poured in a wide fall into the lake below. The ruins of these vast buildings and the wide sheet of falling water closed up the entrance of the valley to Saint Benedict as he came from Enfide; to-day the narrow valley lies open before us, closed only by the far off mountains. The path continues to ascend, and the side of the ravine, on which it runs, becomes steeper, until we reach a cave above which the mountain now rises almost perpendicularly; while on the right hand it strikes in a rapid descent down to where, in Saint Benedict’s day, five hundred feet below, lay the blue waters of the lake. The cave has a large triangular-shaped opening and is about ten feet deep. 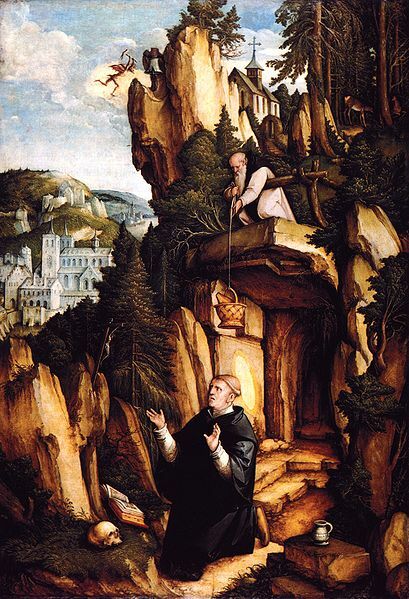 On his way from Enfide, Benedict met a monk, Romanus, whose monastery was on the mountain above the cliff overhanging the cave. Romanus had discussed with Benedict the purpose which had brought him to Subiaco, and had given him the monk’s habit. By his advice Benedict became a hermit and for three years, unknown to men, lived in this cave above the lake. Saint Gregory tells us little of these years, He now speaks of Benedict no longer as a youth (puer), but as a man (vir) of God. Romanus, he twice tells us, served the saint in every way he could. The monk apparently visited him frequently, and on fixed days brought him food. During these three years of solitude, broken only by occasional communications with the outer world and by the visits of Romanus, he matured both in mind and character, in knowledge of himself and of his fellow-man, and at the same time he became not merely known to, but secured the respect of, those about him; so much so that on the death of the abbot of a monastery in the neighborhood (identified by some with Vicovaro), the community came to him and begged him to become its abbot. Benedict was acquainted with the life and discipline of the monastery, and knew that “their manners were diverse from his and therefore that they would never agree together: yet, at length, overcome with their entreaty, he gave his consent” (ibid., 3). The experiment failed; the monks tried to poison him, and he returned to his cave. From this time his miracles seen to have become frequent, and many people, attracted by his sanctity and character, came to Subiaco to be under his guidance. For them he built in the valley twelve monasteries, in each of which he placed a superior with twelve monks. In a thirteenth he lived with “a few, such as he thought would more profit and be better instructed by his own presence” (ibid., 3). He remained, however, the father or abbot of all. With the establishment of these monasteries began the schools for children; and amongst the first to be brought were Maurus and Placid. The remainder of Saint Benedict’s life was spent in realizing the ideal of monasticism which he has left us drawn out in his Rule. How long he remained at Subiaco we do not know. Abbot Tosti conjectures it was until the year 529. Of these years Saint Gregory is content to tell no more than a few stories descriptive of the life of the monks, and of the character and government of Saint Benedict. The latter was making his first attempt to realize in these twelve monasteries his conception of the monastic life. We can fill in many of the details from the Rule. By his own experiment and his knowledge of the history of monasticism the saint had learnt that the regeneration of the individual, except in abnormal cases, is not reached by the path of solitude, nor by that of austerity, but by the beaten path of man’s social instinct, with its necessary conditions of obedience and work; and that neither the body nor the mind can be safely overstrained in the effort to avoid evil (ibid., 64). Thus, at Subiaco we find no solitaries, no conventual hermits, no great austerities, but men living together in organized communities for the purpose of leading good lives, doing such work as came to their hand – carrying water up the steep mountain-side, doing the other household work, raising the twelve cloisters, clearing the ground, making gardens, teaching children, preaching to the country people, reading and studying at least four hours a day, receiving strangers, accepting and training new-comers, attending the regular hours of prayer, reciting and chanting the Psalter. The life at Subiaco and the character of Saint Benedict attracted many to the new monasteries, and their increasing numbers and growing influence came the inevitable jealousy and persecution, which culminated with a vile attempt of a neighboring priest to scandalize the monks by an exhibition of naked women, dancing in the courtyard of the saint’s monastery (Dial. Saint Greg., 8). 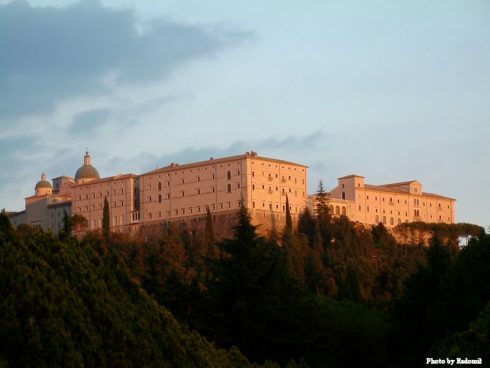 To save his followers from further persecution Benedict left Subiaco and went to Monte Cassino. Upon the crest of Monte Cassino “there was an ancient chapel in which the foolish and simple country people, according to the custom of the old Gentiles, worshipped the god Apollo. Round about it likewise upon all sides there were woods for the service of devils, in which, even to that very time, the mad multitude of infidels did offer most wicked sacrifice. The man of God, coming hither, feat in pieces the idol, overthrew the altar, set fire on the woods and in the temple of Apollo built the oratory of Saint Martin: and where the altar of the same Apollo was, he made an oratory of Saint John: and by his continual preaching he brought the people dwelling in those parts to embrace the faith of Christ” (ibid., 8). On this spot the saint built his monastery. 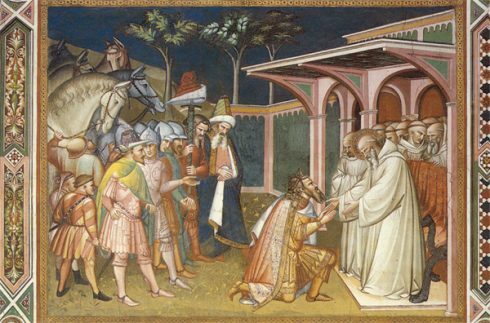 His experience at Subiaco had led him to alter his plans, and now, instead of building several houses with a small community in each, he kept all his monks in one monastery and provided for its government by appointing a prior and deans (Rule, 65, 21). 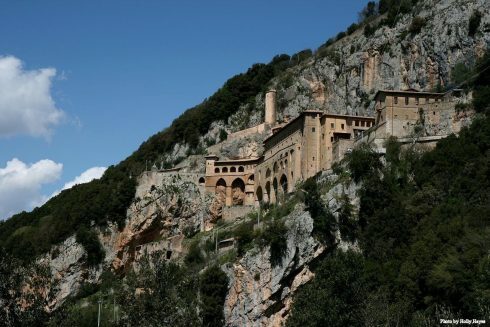 We find no trace in his Rule, which was most probably written at Monte Cassino, of the view which guided him when he built the twelve small monasteries at Subiaco. The life which we have witnessed at Subiaco was renewed at Subiaco was renewed at Monte Cassino, but the change in the situation and local conditions brought a corresponding modification in the work undertaken by the monks. Subiaco was a retired valley away in the mountains and difficult of access; Cassino was on one of the great highways to the south of Italy, and at no great distance from Capua. This brought the monastery into more frequent communication with the outside world. It soon became a centre of influence in a district in which there was a large population, with several dioceses and other monasteries. Abbots came to see and advise with Benedict. 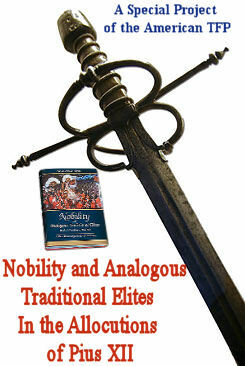 Men of all classes were frequent visitors, and he numbered nobles and bishops among his intimate friends. There were nuns in the neighborhood whom the monks went to preach to and to teach. There was a village nearby in which Saint Benedict preached and made many converts (Dial. Saint Greg., 19). The monastery became the protector of the poor, their trustee (ibid., 31). their refuge in sickness, in trial, in accidents, in want. Thus during the life of the saint we find what has ever since remained a characteristic feature of Benedictine houses, i.e. the members take up any work which is adapted to their peculiar circumstances, any work which may be dictated by their necessities. Thus we find the Benedictines teaching in poor schools and in the universities, practicing the arts and following agriculture, undertaking the care of souls, or devoting themselves wholly to study. No work is foreign to the Benedictine, provided only it is compatible with living in community and with the performance of the Divine Office. This freedom in the choice of work was necessary in a Rule which was to be suited to all times and places, but it was primarily the natural result of the which Saint Benedict had in view, and which he differs from the founders of later orders. These later had in view some special work to which they wished their disciples to devote themselves; Saint Benedict’s purpose was only to provide a Rule by which anyone might follow the Gospel counsels, and live, and work and pray, and save his soul. Saint Gregory’s narrative of the establishment of Monte Cassino does little more for us than to supply disconnected incidents which illustrate the daily life of the monastery. We gain only a few biographical facts. From Monte Cassino Saint Benedict founded another monastery near Terracina, on the coast, about forty miles distant (ibid., 22). To the wisdom of long experience and to the mature virtues of the saint, was now added the gift of prophecy, of which Saint Gregory gives many examples. Celebrated among these is the story of the visit of Totila, King of the Goths, in the year 543, when the saint “rebuked him for his wicked deeds, and in a few words told him all that should befall him, saying ‘Much wickedness do you daily commit, and many sins have you done: now at length give over your sinful life. Into the city of Rome shall you enter, and over the sea shall you pass: nine years shall you reign, and in the tenth shall you leave this mortal life.’ The king, hearing these things, was wonderfully afraid, and desiring the holy man to commend him to God in his prayers he departed: and from that time forward he was nothing so cruel as before he had been. Not long after he went to Rome, sailed over into Sicily, and in the tenth year of his reign he lost his kingdom together with his life.” (ibid., 15). Totila’s visit to Monte Cassino in 543 is the only certain date we have in the saint’s life. It must have occurred when Benedict was advanced in age. Abbot Tosti, following others, puts the saint’s death in the same year. Just before his death we hear for the first time of his sister Scholastica. “She had been dedicated from her infancy to Our Lord, and used to come once a year to visit her brother. To whom the man of God went not far from the gate to a place that did belong to the abbey, there to give her entertainment” (ibid., 33). They met for the last time three days before Scholastica’s death, on a day “when the sky was so clear that no cloud was to be seen”. The sister begged her brother to stay the night, “but by no persuasion would he agree unto that, saying that he might not by any means tarry all night out of his abbey…. The nun receiving this denial of her brother, joining her hands together, laid them on the table; and so bowing her head upon them, she made her prayers to Almighty God, and lifting her head from the table, there fell suddenly such a tempest of lightening and thundering, and such abundance of rain, that neither venerable Bennet, nor the monks that were with him, could put their head out of door” (ibid., 33). Three days later, “Benedict beheld the soul of his sister, which was departed from her body, in the likeness of a dove, to ascend into heaven: who rejoicing much to see her great glory, with hymns and lauds gave thanks to Almighty God, and did impart news of this her death to his monks whom also he sent presently to bring her corpse to his abbey, to have it buried in that grave which he had provided for himself” (ibid., 34). It would seem to have been about this time that Saint Benedict had that wonderful vision in which he came as near to seeing God as is possible for man in this life. Saint Gregory and Saint Bonaventure say that Benedict saw God and in that vision of God saw the whole world. Saint Thomas will not allow that this could have been. Urban VIII, however, does not hesitate to say that “the saint merited while still in this mortal life, to see God Himself and in God all that is below him”. If he did not see the Creator, he saw the light which is in the Creator, and in that light, as Saint Gregory says, “saw the whole world gathered together as it were under on beam of the sun. At the same time he saw the soul of Germanus, Bishop of Capua, in a fiery globe carried up by the angels to Heaven” (ibid., 35). Once more the hidden things of God were shown to him, and he warned his brethren, both “those that lived daily with him and those that dwelt far off” of his approaching death. “Six days before he left this world he gave orders to have his sepulcher opened, and forthwith falling into an ague, he began with burning heat to wax faint; and when as the sickness daily increased, upon the sixth day he commanded his monks to carry him into the oratory, where he did arm himself receiving the Body and Blood of our Savior Christ; and having his weak body holden up betwixt the hands of his disciples, he stood with his own hands lifted up to heaven; and as he was in that manner praying, he gave up the ghost” (ibid., 37). He was buried in the same grave with his sister “in the oratory of Saint John the Baptist, which [he] himself had built when he overthrew the altar of Apollo” (ibid.). There is some doubt whether the relics of the saint are still at Monte Cassino, or whether they were moved in the seventh century to Fleury. 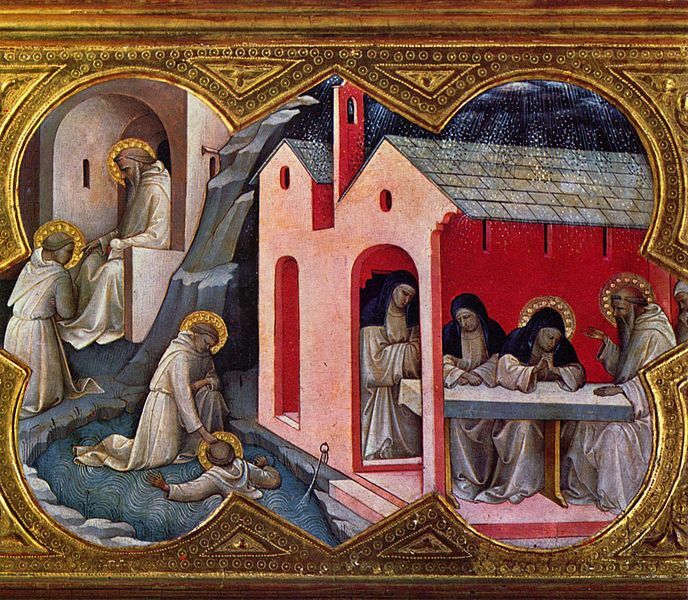 Abbot Tosti in his life of Saint Benedict, discusses the question at length (chap. xi) and decides the controversy in favor of Monte Cassino. 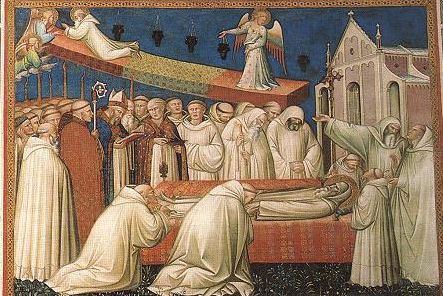 The Death of St. Benedict. A scene from Stories from the Legend of St Benedict by Spinello Aretino. Born into the Roman nobility in 480 A.D., four years after the fall of the Western Roman Empire to the barbarian Odoacer, St. Benedict would become an instrument of God to rebuild Christian Europe. The Roman world seemed to be coming apart at the seams. 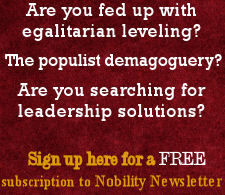 Law, order, structured authority crumbled everywhere and barbarian might ruled. Odoacer is soon defeated by the Ostrogoth king Theodoric and wave follows barbarian wave crashing against and breaking down the edifice of civilization and every symbol of Roman authority. God called forth St. Benedict from these ruins and used the religious order he founded to Christianize and civilize Europe once more. St. Benedict’s achievements proved again how true is the phrase inscribed at the base of the obelisk in St. Peter’s Square: “Stat crux dum volvitur orbis!” [The Cross stands while the world spins] and fully justified the title given him by Pope Pius XII: Father of Europe.